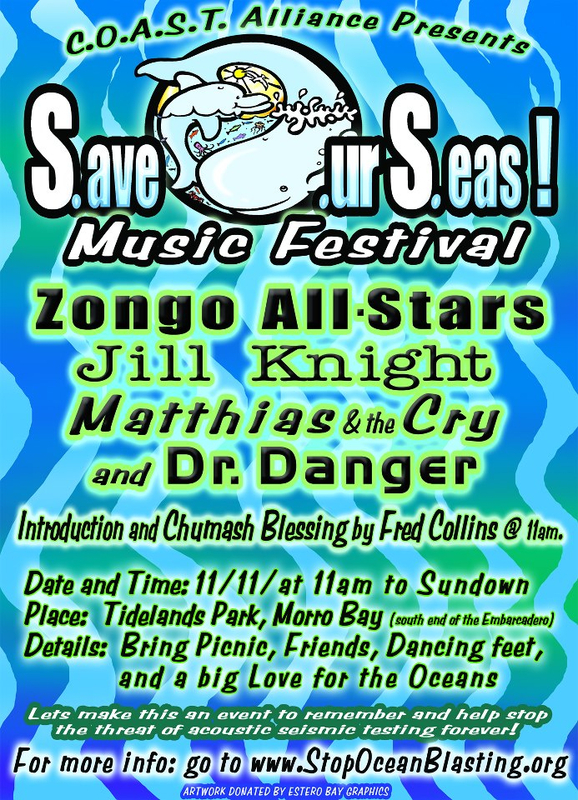 FREE MUSIC FESTIVAL IN MORRO BAY! Introduction and Chumash Blessing by FRED COLLINS of the Northern Chumash Tribal Council. ALSO: Special Guests and Solo Artists such as COASTS’ own Molly McCabe and Aaron Ochs! **** WE ARE ALL COMING TOGETHER TO SHOW OUR SUPPORT OF THE OCEAN AND TO MAKE A STATEMENT THAT WE REJECT THE IDEA OF THE PROPOSED SEISMIC TESTING, ENDANGERING SEA LIFE ON A MASS SCALE!